The other goal of my life lately, in addition to becoming the best rider possible, has been exploration. Leaving New York was like being sprung from a trap and starting this work-from-home existence has been like being released from prison. It was a ten-year long sentence and I see now it was a prison of my own making. I knew intuitively the moment I joined the office world just a couple months after graduating from college that it wasn’t right for me. I simply wasn’t cut out for it–but I didn’t listen to my body and myself. I just changed jobs, every time getting the same type of work that didn’t suit me, and every time believing that it was the only path available. My confidence eroded over time and I saw no other options. I knew that I wanted and needed to get out of the commuter lifestyle because it was killing me–but I came to believe that desire was unrealistic and wrong. “This is just the way it is,” was the message that was drilled into me by the surrounding culture. But it doesn’t need to be that way. Now several months into the working from home, my perspective is so much clearer. So many paths and opportunities and adventures now feel open to me that I thought were closed off. The biggest one of those has been the ability to explore other parts of the country and places to live in. My boyfriend and I tried out LA for a few months, and decided it was not for us. On the surface, it seems easy to live there–the mild weather, the friendly-seeming people. But beneath that, it is an unnatural place and life there is very out of balance. And for someone who grew up surrounded by the natural beauty of woods and water, the landscape there–carved out in a desert–is not comforting or inspiring. The one great thing about living in LA was my barn there. I was too busy to write about my last several lessons before leaving, but they were wonderful. I felt comfortable at this barn and like I was thriving and learning and growing as a rider. The courses felt less intimidating and more solvable and exciting. My trainer remarked that I was getting better every lesson. The horses there were some of the best quality horses I’ve ever had the pleasure to ride–and that in itself gave me the opportunity to grow and jump more and higher than I ever have. 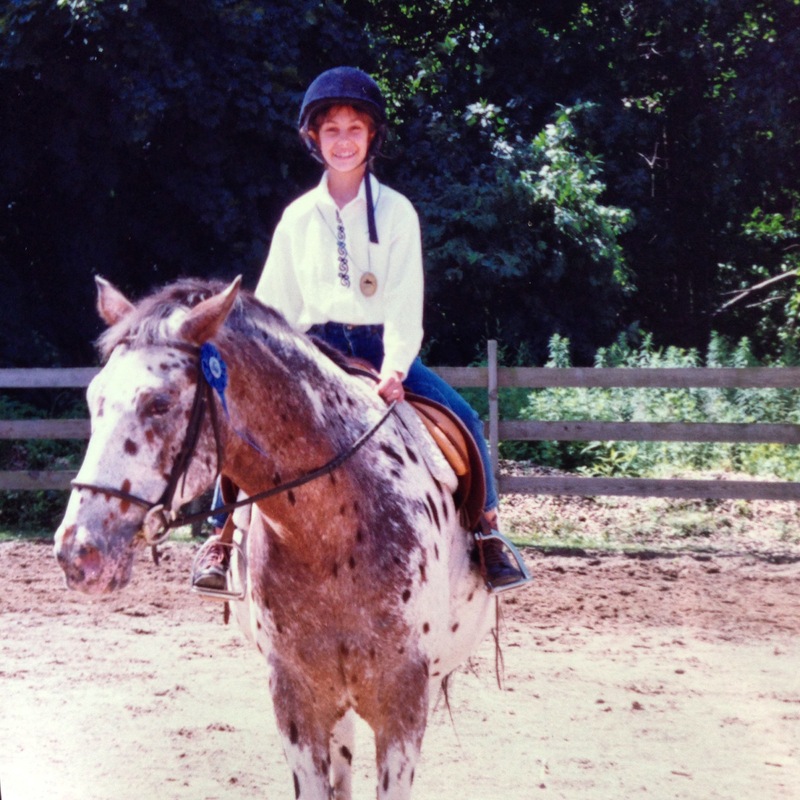 In my last few lessons I also discovered a horse that suited me very well–a chestnut quarter horse named Flash who seemed to move at my rhythm and who was very fun to jump. Leaving the city was a no-brainer–it’s expensive to live there and not what I’m looking for across many factors–but the part of that decision that meant leaving that barn was a tough one. Ultimately, I realized that I will likely be able to find a similar level of riding and a comfortable barn at which I can grow elsewhere. To remain in a situation in which I was otherwise not satisfied would have been a trap in its own way. So, we packed up our few belongings and the cats into our trusty truck that had already gotten us across the country once and headed East. For now, we’re staying with family in Texas, taking a breather and taking stock. Discussing priorities, compromises we are willing and unwilling to make, and dreams to pursue. Talking about the kinds of lives we want to live. One thing I know for sure is that I never want to stop riding like I did for all those years back in NYC. I want horses to always be a part of my life, and a big part of it. While we’re here in Texas deciding on the next place to explore, I’m making it a priority to keep riding. Even if I’m not staying to put down roots at a barn, I can keep myself in riding shape. Last week I had a lesson at a barn that turned out to not be for me–it was almost distressingly run down and dilapidated. I rode a horse that in his day was quite a nice showjumper, from the pictures the owner showed me; now at the age of 30, he is in incredible shape for a horse so old, but is certainly not capable of performing at the level that I need in order to progress. We had a relaxed flat lesson working on transitions, which is always useful, but I left feeling unfulfilled and unchallenged. I’m currently looking around for another barn to try in the area. There are a few of them, and it’s just about narrowing down which one has the right feel. It’s just like what I’m doing in the rest of my life–exploring, trying things out, and for the first time since I can remember, having the freedom to decide what is right for me and actively shape my life to be the way I want it. Holy crap, I love my new barn. There was a chance of showers today and because of that I ended up being the only one who showed for class. Rain happens so infrequently here that it really puts these people in a tizzy. There was no actual rain other than a tiny sprinkle on the drive over, so I ended up having a private lesson. The trainer I rode with last week was out of town at a show so I rode with her assistant and we had a great time. I’m trying to remember the last time I rode for a full hour in a private lesson. It never happened at Jamaica Bay, and not at Kensington either…but it also never happened in college, since I rode with the equestrian team. So the last time would have been back in high school, when I was 17 years old. It was luxurious today, but man was it a workout. I am beat. I have that super-relaxed feeling throughout my body that I can only get from really pushing myself, where I’m so tired out that everything is just copacetic. It’s only the exhaustion of exertion that brings this feeling; knowing I worked hard and nothing can really rile me anymore because now it is time to rest. I rode a really adorable little mare today named Jackie O., an appaloosa (spotted horse) who is mostly black with some white spots on her backside. I have a soft spot in my heart for appaloosas ever since I rode one named Apple Jack in my first show when I was nine years old. She had without a doubt the most comfortable canter I have ever experienced in my life. I could have just cantered around on her all day long and barely broken a sweat. Having so much time to play with, the trainer set up a number of flat exercises for me. First while warming up, she had me do four circles as I went around the ring (one at each end and then two more in the middle) to work on bending. She said she often has kids in her lessons who aren’t advanced enough to understand the theory behind it but that it’s good for Jackie to be trained this way since she had a tendency to fall in on the inside of the circle. The idea was to keep a good bend on her by pushing her out with my inside leg (something I had to work on a great deal with Misfit back in NY.) The trainer said something that really illustrated the movement I needed to do with my legs to get the desired effect, putting it a way I’d never heard before that was incredibly clear: she said, “Pretend like you’re trying to cross your legs through the horse.” My outside leg would go back a little bit, to keep the horse moving forward, but my inside leg would come a little bit forward and move into the side of the horse to push her toward the outside. As soon as she said that, it clicked perfectly in my mind and I was able to get a much more consistent bend. The next exercise we did was using the tall lamp posts at each quarter of the ring to change the length of the trot. When I came to the lamp post at the end of the ring, I used my seat to sit deeper and post slower, putting my horse into a shorter, more collected, more upright stride. Then at the next lamp post on one side of the ring, I pushed her into a longer, more extended trot. We went back and forth between these two extremes at each quarter of the ring, trying to make the transition perfectly abrupt right at the lamp post. This is kind of a dressage-y exercise. It’s no secret that I don’t really get into dressage; I just think it’s kind of no fun, especially compared to jumping. But the few basics I’ve been taught over the years can be incredibly helpful exercises to build control with your horse and your body. It’s nice to slow it down sometimes and take this more mindful approach to training, so today I quite enjoyed doing it. It was nice to have several opportunities–with all of these exercises–to improve as well. I could see, and my trainer pointed out constructively, where I made mistakes or how I could do it better the next time and then I got a chance to put that into practice. The next exercise was almost exactly the same as the previous but the difference was that each lamp post signaled the alternation of trot and canter. This was a little bit more of a challenge, but not for the reasons I expected. Typically I have a little trouble with the upward transition from trot to canter. When I ask for the canter, often my horse simply speeds up at the trot, getting into this sort of frantic, disorganized mess of running that makes me feel sloppy and ineffectual, and I compensate by inappropriately using my upper body to rock us into the canter. That was not an issue at all today; Jackie O. smoothly transitioned right into her perfectly smooth canter with the barest of urging. She’s even more responsive than the horse I rode last week, Bella. The challenge came on the downward transition, when Jackie didn’t want to come back to the trot. I think she would have been as happy as I would to have been cantering around for hours as well. The downward transitions therefore required a little more planning and a lot more work from my seat and my mid back to really sit up deep in the saddle and ease her back down to the trot. Luckily I’ve recently discovered the joys of the mid-row weight machine at the gym, but I still think this is going to leave me pretty sore there for at least a day or two. When I rode through them, it created the shape of two back-to-back uppercase Ds. The first time through I turned right afterwards, the next time through I turned left afterwards, making it a kind of squared-off figure eight maneuver. This incorporated skills we had used in earlier exercises, namely the bending on the turns and the lengthening and shortening of stride over the poles. After that, the trainer had me do the same pattern but with alternating trot and canter. I was to canter the whole way around but return to the trot for the poles. The tough part was that I was only allowed to trot after I made the full turn toward the cavaletti, giving me a very short distance to slow her down and not allowing me to use the movement of the turn to accomplish that. If her hind end wasn’t completely on the straight line toward the poles when I began trotting that, the trainer said with a smile, would be cheating. I wasn’t sure how this was going to go, given Jackie’s enthusiasm for cantering, but it went surprisingly well. After talking softly to her and employing some rather strong half halts to get her settled, she seemed to understand the game very quickly and came back to the trot much more easily than she had before. Over the poles, I encouraged her with plenty of praise, patting her and telling her she was a good girl. The trainer said I should tell that to myself, as well. Finally, we did a bit of jumping. There was a crossrail set on the diagonal of the ring and we jumped it on a figure eight pattern as well. Coming off the left lead it was a relatively easy turn because of the angle it was at. When I had to come at it off the right lead, the turn was much, much tighter and shorter. The first couple times through it, my rhythm was way off. I had felt really strong and supple throughout the lesson but could now finally feel a bit of muscle fatigue from all those exercises. But really the problem was just me being a hothead who wanted to leave out a stride that needed to be there. Jackie apparently has the tendency as well, but she was smart enough to see that with her little stride she needed another step. I was pushing her up too close and she was jamming it in there last minute as I was already up in jumping position expecting us to have taken off. We did it again and at the trainer’s suggestion I waited a beat, sitting up and opening my shoulder blades early in the turn instead of closer to the jump. Once I understood that we needed one more stride in there and didn’t try to push for the long takeoff, the timing fell back into place and we were able to do it a few times very smoothly. I feel great about today’s lesson for a number of reasons. I haven’t put that much work into my riding, physically and mentally, in a good while and that is what I have been longing for, to really nerd out on it and get deep into theory and the repeated, punishing practice of that theory to whip myself back into shape. I also felt proud of my improvements as I learned better how to do each exercise. It was really nice that the trainer kept saying how much fun it was to do these things with me since she normally teachers younger students who aren’t advanced enough for it. Everyone I meet at the barn continues to be really friendly, helpful and welcoming. Both horses I’ve ridden so far have been stellar. The barn manager was even playing some Judas Priest while I was untacking. Another great thing is that my classes here are a few dollars cheaper than my lessons back in Brooklyn. With that savings, plus the much larger savings of not having to pay for a Zipcar, I’m going to be riding much more consistently, pretty much every week. I can’t wait to see where I am after a month, or two months of this more consistent training. Despite the occasional alienation that riding in the city inspires, there’s one thing that remains reassuringly familiar at the barn: the young girls that spend almost all their free time there. I suspect they are to be found at every barn in the country. Some of them work there, helping to groom and tack the horses in exchange for lessons; some of them seem to just hang around. I know these barn girls well, having been one for most of my teenage years. They can be clique-ish, or competitive with each other, but are mostly sweet and helpful to those of us that only ride there and aren’t part of the little barn family. They can fall in and out of favor with each other and with the various instructors that teach them, but one aspect of their loyalty remains unwavering: the intense attachments they form to the horses. If they see you riding up to the barn on one of their favorites, they’ll scamper up to hug your mount and no matter how many times they’ve already seen the horse already that day, exclaim, “My baby!” and breathlessly ask you, “Was he good?” They don’t really want an answer; they want a connection. They love this animal so much and simply want to talk to someone else who loves him too. It’s like a teenager with a crush, having the absolutely insatiable compulsion to speak about the object of their affection, constantly, to know and to discuss every detail about them. There’s one girl in particular who loves my favorite horse, so I end up talking to her most often. She’s probably fourteen and just slightly more awkward than the rest of her friends at the barn. So in response to her asking me if he was good this Saturday as I dismounted and handed her the reins, I didn’t tell her that in fact he was a cranky nutjob that day. That he, despite being a male horse with no balls, sometimes for no reason tries to kick the other horses like the bitchiest mare. That for no reason whatsoever he has formed some strong convictions about going in the rightward direction around the ring. (We always start off the lesson going left, trot around several times, and then switch direction.) When I turn him to go right, the horse that was enthusiastic and responsive turns into a stubborn little mule who puts his ears flat back on his skull, bucks, backs up, and paws the ground. I didn’t tell her about turning him in tiny circles for ten minutes to prevent him from continuing with this rude behavior and that while I pulled his nose around toward his own tail he actually tried to–I swear I laughed out loud at this move–bite my foot. I didn’t bother to tell her these things because despite all of that–actually, because some of that, frankly the foot biting attempt was incredibly endearing to me–this horse is also my favorite horse at the barn. He’s fun and he’s comfortable and he responds to the slightest little touch of my fingers on the reins when I want him to shorten his stride and become more collected so we can look pretty together. He doesn’t dance around when I’m trying to mount up and once I’m on, waiting, he stands patiently. He’s calm with loud noises and not that fazed when the more skittish horses in the group get jumpy. He’s small and wonderfully proportioned and has a shiny, liver chestnut coat that stands out among the more common bays and lighter chestnuts. When I lean down to pat him after the lesson is over, after we’ve fought and made up and he’s spent the rest of the time being his normal charming self, I bury my face in his mane and inhale the most reassuring and homey smell I know. I feel closer to this huge animal on this day than any other so far. And as I tell her, “Yes, he’s such a sweetheart!” and smile at the young girl, I feel close to her, too.